Not everyone is a developer and we account for it. Workflow Engine comes with an inbuilt HTML5 visual designer that allows anyone to create interactive workflows of any complexity in a snap without the need to draft them programmatically. 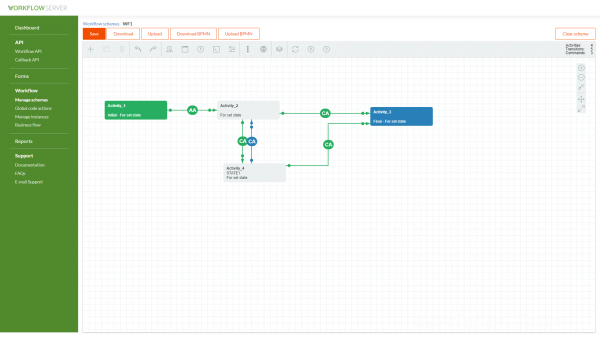 We leverage the native element to let you design, model, edit and visualize your custom workflows. Drag & drop your workflow activities to a desired place on canvas without losing connections or add new transitions between activities. Do not bother rearranging a workflow on canvas and let our inbuilt algorithms do the job of placing all the element on canvas the best way possible. Snap each activity to grid increments on your canvas to make a clean, readable and structured layout of your custom workflow design. Increase or decrease the magnification of the workflow display to make it easy to see the whole picture and tweak activities and transitions. Workflow Engine offers its users all the components necessary to implement workflows of any complexity and helping them to adhere to consistent business processes. Workflow Engine is designed to improve organizational efficiency and productivity, allowing companies to concentrate on performing the work rather than managing the workflow. Workflow Engine comes with an in-built version control that helps you keep track of any changes introduced to your workflows and revert them upon necessity. Whenever you update a workflow the engine versions your changes, letting you choose whether you want existing processes to finish running the old version or to force them to run a new one. Workflow Engine makes it possible to split your workflow into multiple branches to execute activities concurrently rather than successively. Successful completion of activities within all branches merges the branches back and advances the process a step forward in your workflow. Workflow Engine generates versioned XML definition files that are stored in a connected database. Besides, the engine’s visual designer provides you with a capability of exporting and importing workflows as backups, or for further reuse and sharing.